To commemorate Henry Hudson’s explorations, the Henry Hudson 400 Foundation commissioned Cartosoft to create a map full of Henry Hudson history: early harbor and coastline illustrations, stories of the first New Yorkers, photos ancient maps, 3D models of Hudson’s ship the Half Moon, and of course, the routes Henry Hudson sailed. The map, created using the Google Maps API, can be found here. The map also includes an “Events” section highlighting modern-day venues, displays, and activities related to the commemoration of Henry Hudson. Explore the New Amsterdam Trail, locate the South Street Seaport where a Henry Hudson historic maps exhibit—including the first known map of Manhattan and the Manhattan purchase document—will open this autumn, visit the shipyard where a replica of the 1614 Onrust is being built, and find the Liberty Science Center, the site of the H209 International Water Forum scheduled for September. The website also lets you to upload stories of your own ancestry to their map. The Henry Hudson 400 Foundation has put together a rich resource to explore this (in)famous part of American history. And talk about a bargain: you can view the map for $24 dollars less than the purchase price of Manhattan! 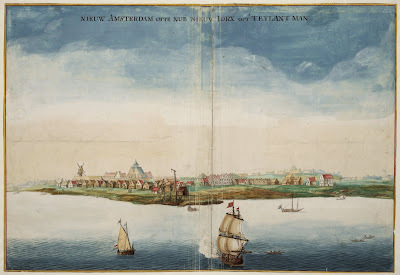 We have all heard the story: in 1626, Dutch colonists purchased the isle of Manhattan for 60 guilders worth of kettles, blankets, beads, mirrors and knives; the equivalent—so the story goes—of $24.